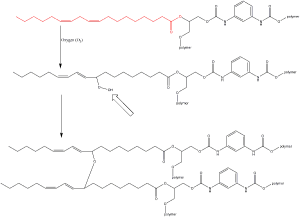 Polyurethane is a polymer (a long chain molecule with repeating units) made by combining a dual isocyanate (this is just the group R-C=N=O, a very reactive species) with a poly (more than one – this is where the POLY in polyurethane comes from) alcohol. 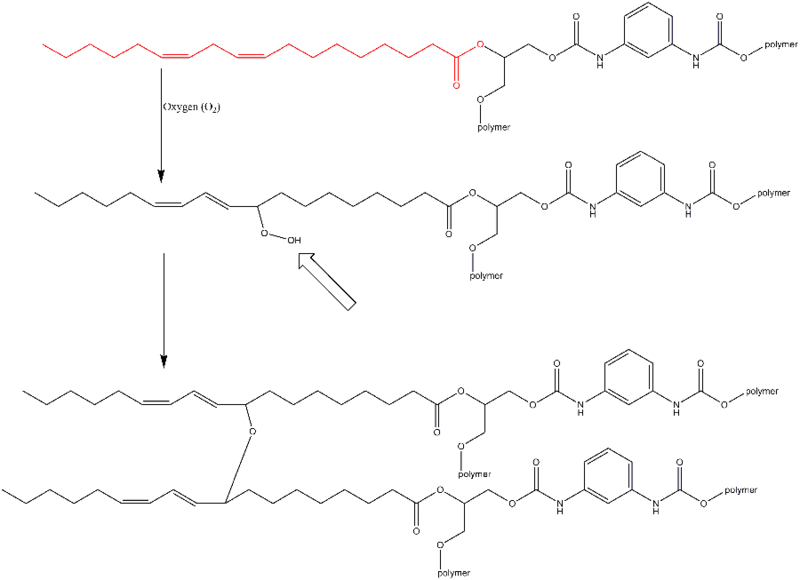 The straight arrows on the left and right (above) indicate where the polymer could continue on, resulting in a larger polymer. So, a polyurethane is a long chain polymer of an isocyanate and a polyol (alcohol with more than one -OH). As soon as the two are mixed the reaction will start. So, as soon as they are mixed the curing process begins. This isn’t very useful for a woodworker (some professions might use a two part polyurethane). If the manufacturer mixed them in a can and sold them to you, by the time you opened the can it would be a solid. Another way to make a film finish is to have everything in one part with the curing process a little slower and controllable. This can be achieved with a uralkyd finish. A uralkyd finish is really what you’re most likely buying at the home center when you buy “polyurethane”. A uralkyd finish combines features of a urethane (above) and an alkyd. What the heck is an alkyd? An alkyd is a polyester with fatty acids sticking off of it. The fatty acids are what give an alkyd finish the ability to polymerize (with oxygen). The process is the same one that gives drying oils, like tung oil, their ability to cure in the presence of oxygen. Below is a uralkyd resin that I drew. The resin below is only an example and the version of uralkyd that you are using will be different (the differences are going to be proprietary by the company that sells it) but the principle is the same. 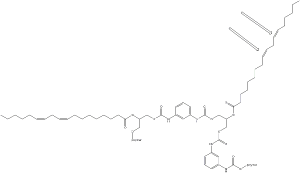 A uralkyd can be viewed as a fatty acid modified polyurethane. After a uralkyd finish is applied to your project and the solvent evaporates, it will begin to cure. This happens at the double bonds (shown with arrows above) which react with a molecule of oxygen (below). After this, it will react with another uralkyd molecule (the R-OOH will first break down into R-O radical and OH radical, but don’t worry about this – see fat arrow below). The process of the double bonds reacting with oxygen, and cross linking, can be accelerated with metal driers which is usually added by the manufacturer. I might dive into the effect of metal driers in more detail in another posting (depends on how this one goes down). 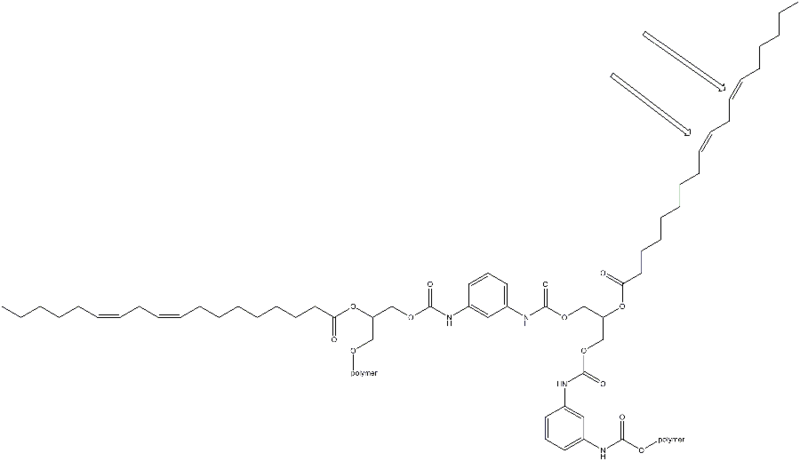 The section of the uralkyd shown in red below is linoleic acid. Linoleic acid is a component in a lot of drying oils, like tung oil. Neat huh? Please let me know if you have questions. ** EDIT (9/9/2015) a uralkyd is still considered a polyurethane because it has poly (many) urethane (also called carbamate) linkages. This entry was posted on Tuesday, September 8th, 2015 at 11:46 pm	and is filed under finishing, Wood Chem. You can follow any responses to this entry through the RSS 2.0 feed. You can skip to the end and leave a response. Pinging is currently not allowed. Interesting, would liek to see an explantion of why urethanes have adhesion problems….as opposed to alkyd finishs (varnishes)which seem to be better behaved in this area. That I don’t know. Hopefully someone will chime in.